SAF Rain Screen Architectural Panel System Evaluated by the Texas Department of Insurance SAF – Southern Aluminum Finishing Co, Inc.
SAF 4000 RainScreen panel system reduces job-site installation time, cost and hassles. It passes the TAS301 Test Protocol established for Miami-Dade HVHZ which includes TAS 201 (Large Missile); TAS 202 (Air, Water & Structure); TAS 203 (Pressure Cycling). Certifications issued for the SAF Series 4000 RainScreen system include panels from three major Aluminum Composite Panel (ACM) manufacturers. The SAF Series 4000 is a drained and back ventilated rain screen panel system incorporating a strip of composite material in a reveal between each panel (instead of caulk) resulting in a more uniform appearance. 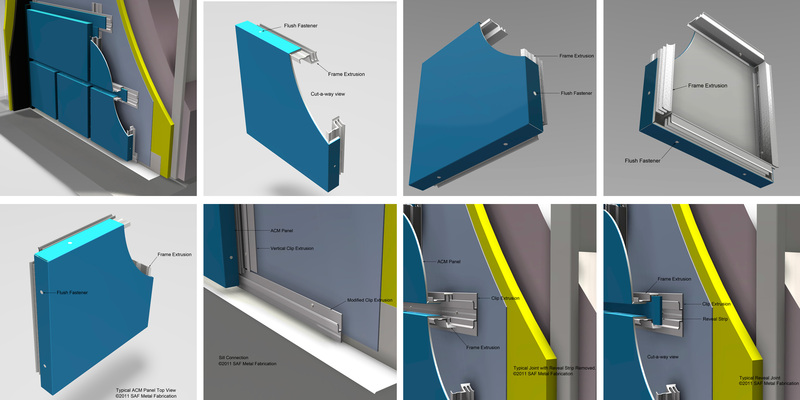 The Series 4000 system ships with fabricated panels and “track” extrusions ready to assemble on a job-site. The system is engineered to allow moisture to permeate the outside wall, but subsequently drain through weep holes on each panel frame.